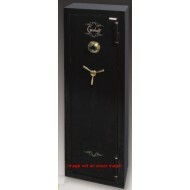 This large Sentry security safe has many high security features. It has solid steel construction and four live locking bolts. In addition it has plenty of adjustable storage with a bungee cord storage system on the door and two adjustable shelves. The FB2714 is the largest of the 1 hour fire safe and RSC Burglary rated safes from Gardall. 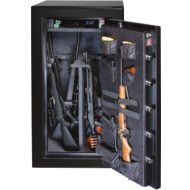 With two 1 1/4" chrome plated locking bolts, an independent glass relocking device to prevent against tampering, 2" thick door and 3" thick body, this safe will keep intruders out. In the event of a fire, its contents will remain safe and secure (the safe comes with a 2 hour K.I.S. fire rating). 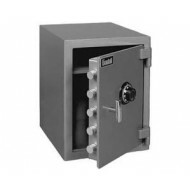 This model has a center anchor hole and hardware supplied to secure this safe in place. 2 adjustable shelves will allow you to modify your setup for maximum storage. 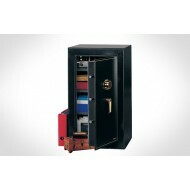 The Gardall B2815 is a heavy duty burglary safe designed to protect cash drawers. If you need indoor delivery on this 329 lb safe, please call877-442-9964 or email customer service at cs@thesafestores.com. There is an extra charge. The steel construction of the B2815 has earned it a UL Burglary Rating. Feature like the heavy steel plate door are designed to deter theft and break-ins. 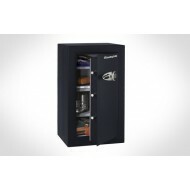 The sturdy and durable Gardall B2815 is a great safe for any valuables at the office and the business. The B-rated burglary safe has been constructed with a 0.5" steel plate door and 0.25" thick body, five live locking bolts and an independent re-locker to prevent any form of forcible entry. Along with four anchoring holes pre-drilled into the bottom, the safe can be bolted to the ground which makes it extra secure from theft. 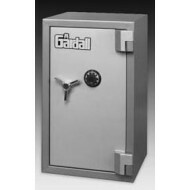 Gardall has released the new BGF series safes! 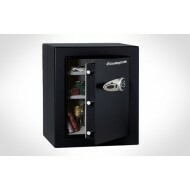 These reasonably priced safes come with UL 60 Minute Fire Rating and UL Residential Security Container (RSC). 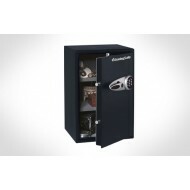 These new safes have everything you need to protect your valuables and/or your guns. 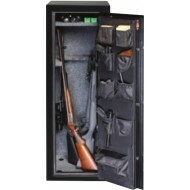 A premium door organizer is included with the safe along with a spyproof dial lock.